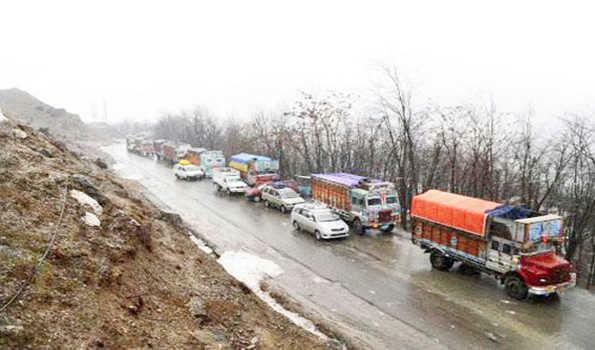 Srinagar, Jan 17: The National Highway, connecting Kashmir valley with the rest of the country, was through for traffic and on Thursday, vehicles will ply from Jammu to Srinagar, a traffic police official said. However, other roads, including National Highway, the only road linking Ladakh region with Kashmir, historic Mughal road and Anantnag-Kishtwar, remained shut due to accumulation of snow which has not frozen. The 300-km-long Srinagar-Jammu National Highway was open for only one-way traffic as road widening and repair continued at several places besides frequent landslides and shooting stones. Today, both Light Motor Vehicles (MLVs) and Heavy Motor Vehicles (HMVs) will ply from Jammu to Srinagar with some restrictions to avoid any traffic jam, official told TNN. No vehicle, including security force convoy, would be allowed from Srinagar to Jammu to avoid traffic jam, he said. In case of any emergency, people can contact Traffic Control Unit (TCU) where the officer concerned can take decision whether to allow the particular vehicle to ply from opposite direction or not. He said all LMVs will be allowed to ply from 0600 hrs from Nagrota, Jammu till 1200 hrs. However, from Jakheni, Udhampur, the LMVs will be allowed to ply between 0700 hrs to 1330 hrs, he said, adding that the HMVs will be allowed from Udhampur after 1300 hrs to 1900 hrs only. No vehicle will be allowed after the deadline, he added. People are advised to contact TCUs at Srinagar, Jammu and Ramban before starting their journey on the highway. He said on Wednesday, over 3,000 passenger vehicles, trucks carrying fruit and empty oil tankers had reached Jammu safely. Traffic official said the National Highway linking Ladakh region with Kashmir remained closed due to accumulation of snow for the past about two months. However, the highway between Drass, the second coldest place in the world where the minimum temperature today was minus 22 degree, border town of Kargil and Leh was through. The Union Government has sanctioned construction of tunnel to make it an all weather road between Kashmir to Leh. Prime Minister Narendra Modi laid the foundation stone for the tunnel. However, it is reported that the only contractor, who had filed tender for construction of tunnel, has now backed out. Fresh tenders would be issued now, official sources told TNN, adding it will further delay construction of tunnel, a long pending demand of people of Ladakh who remained cut off from the rest of the country for winter months. Traffic official said the 86-km-long historic Mughal road, connecting Shopian in Rajouri and Poonch in Jammu region also remained closed due to snow. There is no immediate chance of reopening of the road, which is seen as alternative to the Srinagar-Jammu highway. The road linking Anantnag in south Kashmir to Kishtwar in Jammu region also remained shut due to accumulation of snow.